All three of the Lamorinda High Schools made the playoffs last season and all have demonstrated the potential to reach the playoffs again this year. 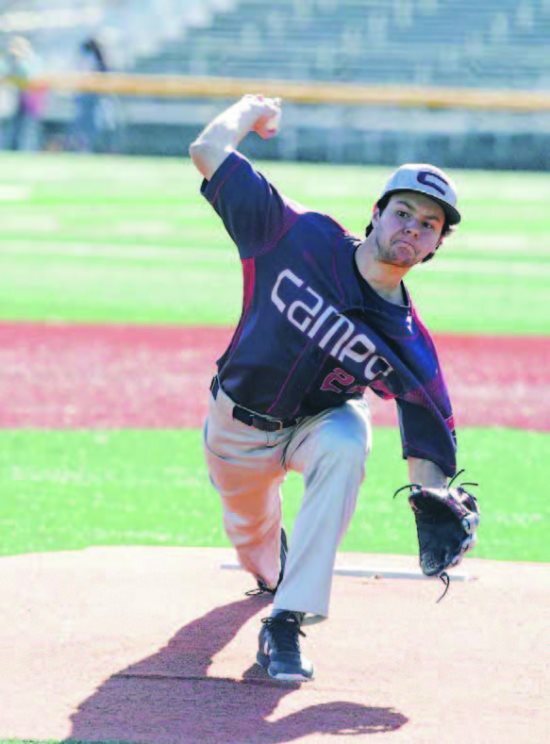 It has become an annual concern for the Campolindo baseball team to be able to get a sufficient amount of practice in due to the seasonal rain, according to head coach Max Luckhurst: "It happens every year. Our field is so marshy that when it rains, it really gets saturated. It's still not playable and you can't even walk across the grass. Since Jan. 28, we've been able to have only one organized practice." 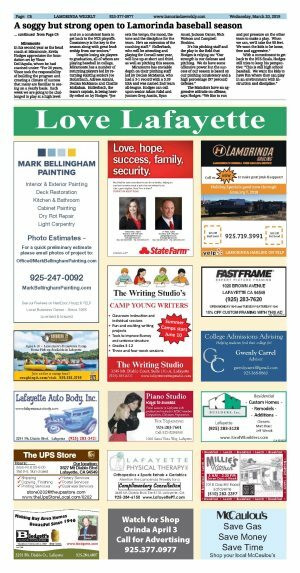 Campolindo won't be playing their first home game until March 26 because they have been forced to play their scheduled home games on the road due to the unplayable conditions of their field. After making it to the North Coast Section finals last season, Luckhurst is not one to allow himself or his team to feel sorry for themselves: "No one is going to feel bad for us. We've got a lot of good guys this year and we'll figure it out. Still we're looking forward to the weather allowing us to practice and work." Where does Luckhurst see the strength of his team? "I wish I had an answer for you. We do have a great work ethic and know-how to face adversity has made us stronger and has helped pull the team together. It makes life interesting to have to just go out and play games." Luckhurst does not name captains but it does help that Campolindo has 12 returners and "all of my returners are leaders by example." The two leading starting pitchers are Michael Cruz, a three-year starter who has been the ace of the staff the last two years and he is ably backed up by Donovan Robles. This is a team with good overall speed headed by Ryan O'Neal, the team's leadoff man, says Luckhurst: "Ryan is our quickest player but we have quite a bit of team speed." The defense is led by outfielder Lucas Allen but there are a lot of changes overall from last year's team. The infield is all new from last year and there are only two returning starters who played the same position last season. Last season Campolindo won six of their last seven games and Luckhurst is looking for a similar type of season this year: "Our goal is to play our best ball at the end of the year. We're taking the whole season to get ready. Hopefully after 24 games, we'll have figured it out." Luckhurst has a very philosophical attitude to the game: "The key for our team to be successful is to limit our mistakes and capitalize on opportunities. The best team does not always win. You have to have some luck on your side. I want our players to compete every day and if they can do that, they can look in the mirror and have no regrets. If that happens, good things will happen." Acalanes' first year head coach Clint Hoover has started off the season with seven straight victories: "Our players know they can compete and not be intimidated by anyone. We play our game and try to get better and better. Our ultimate goal is to win the NCS tournament and the start of the season has given us a lot of confidence." There is only one senior on the team, Scott Bryan, with a number of juniors and sophomores making up the bulk of the roster. It's still a maturing team, says Hoover: "Some of our players had varsity time last year so we do have some experience and the team is developing every day." The Dons have a lot of depth with their pitching staff led by Nick Kresnak and Logan Hurd. Says Hoover: "Eddie Burns has good stuff, Michael Castelli does a good job and Andrew Peterson, a lefty, is good out of the pen." There is a solid defense backing up the pitching. The outfield has good speed and range. Nick Bamont is in center and is flanked by Scott Brydon in right and Sam Heyman in left, though each has the skills to play center. The team's offense is led by Kresnak - who plays third when not pitching - Tommy Thrasher, Davis Diaz and Thatcher Hurd. Hoover appreciates the depth he has here: "We've been improving our batting each game and there are a lot of players that can really step up." It's the little things that are key for Hoover: "To be ultimately successful, we need to be consistent, staying hungry, keep improving and have everyone know their role." In his second year as the head coach at Miramonte, Kevin Hodges appreciates the foundation set by Vince Dell'Aquila, whom he had coached under: "For 26 years, Vince took the responsibility of building the program and creating a climate of success that many are familiar to seeing on a yearly basis. Each week we are going to be challenged to play at a high level and on a consistent basis to get back to the NCS playoffs. Consistency is the key to the season along with great leadership from our seniors." 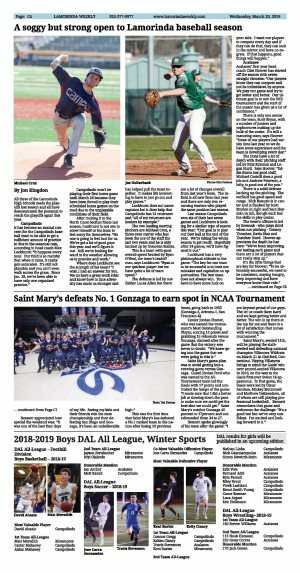 Despite losing six players to graduation, all of whom are playing baseball in college, Miramonte has a number of returning players led by returning starting seniors Joe Hollerbach, Adrese Azzani, Declan McManus and Charlie Mollahan. Hollerbach, the team's captain, is being heavily relied on by Hodges: "Joe sets the tempo, the mood, the tone and the discipline for the team. He's an extension of the coaching staff." Hollerbach, who will be attending and playing for Cornell next year, will line up at short and third as well as pitching this season. 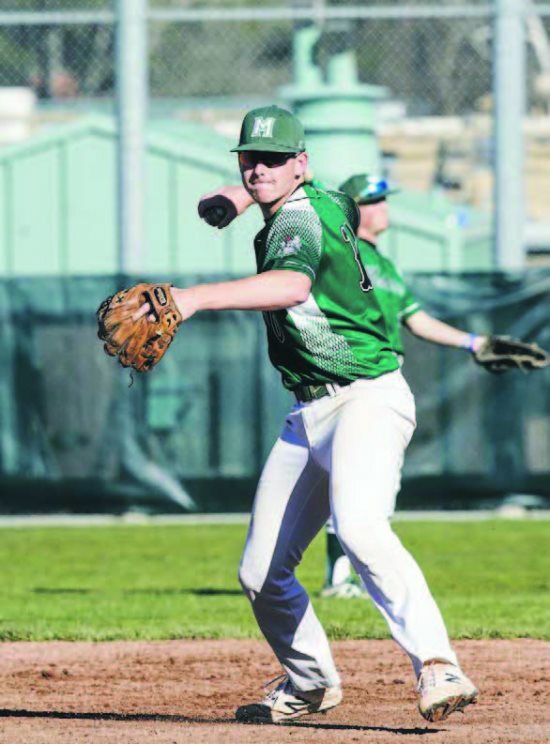 Miramonte has enviable depth on their pitching staff led by Declan McManus, who had a 3-1 record with a 3.59 ERA and was named 2nd team all-league. Hodges can call upon senior Adam Fahd and juniors Greg Austin, Ryan Ansel, Jackson Oxner, Nick Watson and Campbell Hoskins. It's his pitching staff and the play in the field that Hodges is relying on: "Our strength is our defense and pitching. We do have some offensive power but the success of our season is based on our pitching consistency and a high percentage (97 percent) defense." The Matadors have an aggressive attitude on offense, says Hodges: "We like to run and put pressure on the other team to make a play. When we can, we'll take the 90 feet. We want the kids to be loose, free and aggressive." With a commitment to get back to the NCS finals, Hodges still tries to keep his perspective: "This is still high school baseball. We want the kids to have fun where they can play in an environment with instruction and discipline."